As the saying goes, history repeats itself. This is especially true in television. As time passes, I notice TV characters returning with ancient problems dressed in modern clothes. Take 2 Broke Girls. Are they not Laverne & Shirley without the brewery (now a diner)? If I had the time, I would calculate how many television shows center on the authority figures including cops, criminals, lawyers and doctors. I’m guessing it’s a very large percent of what’s been created. Why are we not bored with our repeating characters? If we watch the same characters, the same roles, over and over, is this not our modern mythology? When there was no television, the images were painted on walls and sculpted from stone and marble. Today’s mythology is digital. As the world of television turns, a recent rise from the grave of forgotten TV characters is Flo. The 21st century Flo (Stephanie Courtney) sells Progressive Auto Insurance (picture from Facebook, a purveyor of faces). 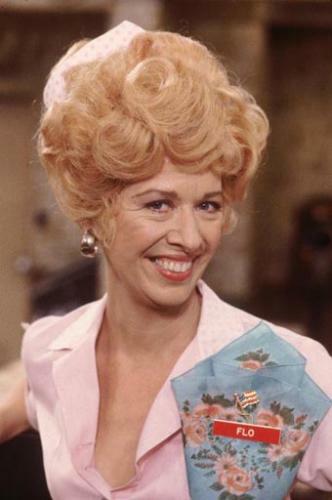 The 20th century Flo (Polly Holliday) was a waitress on the show Alice known for her spunky attitude, love of men and angry retort “Kiss my grits” (picture from http://www.screeninsults.com). What do the Flos have in common? Both century’s Flos are spirited, red lipped with upwardly trending hair. Both wear a uniform, a name badge and are your energetic and lovable Working Girl. In this life they are Working Girl but in another time or place, say ancient Greece, they could have been Helen of Troy (or, more appropriately, Flo of Troy). Astrologically, our Flos are defined by a pinch Mars/Aries, and a dash of Aquarius/Uranus. They are a little offbeat (Aquarius) and a little mouthy about it (Aries). Progressive Flo has sun conjunct Venus in Aquarius. Venus on your sun is indicative of beauty (as viewed by others). Aquarian beauty is a rare combination of classic and unique. Aquarius is electric so Progressive Flo probably generates energy around her that attracts others who wonder what she’s about. Waitress Flo has both Uranus and Venus in Taurus. Venus and Uranus in the same sign suggests uniqueness or differentness in regard to beauty and pleasure; in Taurus, it’s a physical, sensual uniqueness. This Flo is probably physically more adventuresome than Progressive Flo because Aquarius is not as comfortable with physical contact as is Taurus. Also, Waitress Flo has sun in warm and cuddly Cancer. Progressive Flo has Mars in Aries (and could have moon in Aries) while Waitress Flo has moon in Aries. Aries is sassy, bossy and dominant. Aries is here, Aries is now. Both Flos take over the screen. Wasn’t there another waitress in the show Alice? What was her name? I’m reading on IMDB that the actress who played Alice (what was her name?) was upset by Flo taking all the attention in the show. Progressive Flo has made a successful career out of three-minute commercials – quite impressive. How much market share is due to Flo? Who’s more popular, Flo or Progressive? What happens if Flo leaves and goes to another insurance company? Or a bank? With Aries and Aquarius in the chart, there is a tendency to rebel. So I wonder if either Flo has Progressive car insurance. It wouldn’t surprise me if Progressive Flo deliberately got, say, State Farm Insurance just to prove independence. Waitress Flo lasted four television years. Progressive Flo is going on five years (Wikipedia says her first commercial was in 2008). Uranus is currently transiting Aries which is conjunct Progressive Flo’s Mars in Aries. Uranus is sudden and Aries is impulsive and a host of world uprisings attest to the emotions that can erupt during this transit. Uranus represents the seven-year itch of urban lore. Progressive Flo may soon be telling her sponsor to kiss her grits. This entry was posted in Actors and tagged aquarius, aries, flo from alice, flo from progressive, mars in aries, Ohio astrology, polly holliday horoscope, stephanie courtney horoscope, Uranus. Bookmark the permalink. Are you going to do something about the government shut-down? Curious! !